Parkinson's disease is a type of motor system disorder or degenerative disorder of the central nervous system that involves the impairment of the person’s speech, motor skills and several other important functions. There are four major symptoms of this condition; and this includes: trembling of the arms, hands, legs, jaw, and the face; tremor; slowness of movement; and postural instability characterized by the impairment of balance and coordination. Genetics. Traditionally, Parkinsons disease was considered a non-genetic disorder, meaning it cannot be acquired thought heredity. However, about 10% of Parkinson’s patients have been found to have monogenic forms of the disease. This means that a person’s genes are considered risk factors for acquiring Parkinson’s. Toxins. Several studies have found that toxins may have a hand in the development of Parkinsons disease in humans. Those who live in rural environments and who are often exposed to pesticides and other harmful chemicals may be at risk of acquiring Parkinson’s. One theory establishes that a person’s vulnerability to environmental toxins can lead to Parkinson’s. Head Trauma. People who have had experiences of head trauma are at risk of Parkinson’s disease. However, several case studies show that head trauma may be an early symptom of Parkinson’s as a result of the impairment of balance and coordination that is associated with the disease. There has been no cure found to treat Parkinsons disease. However, there are several medications prescribed to patients to relieve them of the symptoms. The most common medication given to patients of Parkinson’s is levodopa and carbipoda. 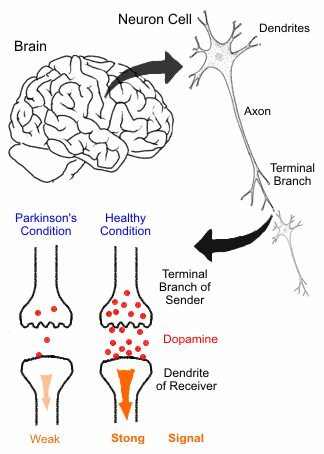 Levodopa works by making dopamine and replenishing the brain’s supply of the neurotransmitter dopamine, and Carbipoda works by delaying the conversion of levodopa to dopamine before it reaches the brain. Levodopa only treats some symptoms of the disease and does not eliminate the symptoms of tremor in patients. There are some people who take the medication but don’t respond to it. In these cases, surgery may be necessary, especially if the symptoms aren’t lessened through the intake of prescribed medication. One process is called deep brain simulation, where electrodes are implanted into the brain by connecting a pulse generator to it. This type of therapy can significantly reduce the need to take Carbipoda and Levodopa. Parkinsons disease is considered a chronic and progressive disease as it persists for a long period of time and the symptoms can become significantly worse as time progresses. The effects of the disease can vary from person to person. Some people who have Parkinson’s become completely disabled, while some only experience minor disruptions of their motor function. People suffering from Parkinson’s disease are encouraged to maintain a healthy diet. This is due to the fact that the muscles and nerves that are responsible for controlling the digestive process may seriously be affected by the disease. The recommended diets for patients include foods that are high in fibre, such as cereals, fruits and vegetables and whole grain bread.